Quantum Conundrum: Curiously Cute, In A Quirky Way. The advent of modern physics engines really opened up a whole new world of games that simply weren’t possible before. Whilst there has always been puzzle platformer games rarely did they have the level of complexity and ability to give rise to emergent behaviour like games with more realistic environments are today. Games like Portal are the perfect embodiment of this idea and Kim Swift, the game designer behind that title, has brought out another curious puzzle platformer: Quantum Conundrum. With such a pedigree behind it Quantum Conundrum deserves a look in and I gave it a play through over the last weekend. Quantum Conundrum takes place inside Quadwrangle Manor, the home of a brilliant scientist who’s designed all sorts of wonderful inventions. You play as his 12 year old mute nephew who was dropped off at the manor to stay with your brilliant scientist uncle because your mother believes he needs the company. Upon arrival however he fails to meet you in the front hallway with one of his latest inventions like he always does and the manor suffers a power outage, seemingly trapping your scientist uncle in an alternate dimension. He is however still able to communicate with you through the security system and he guides you through his manor as you work to restore power and hopefully restore him back to the real world. 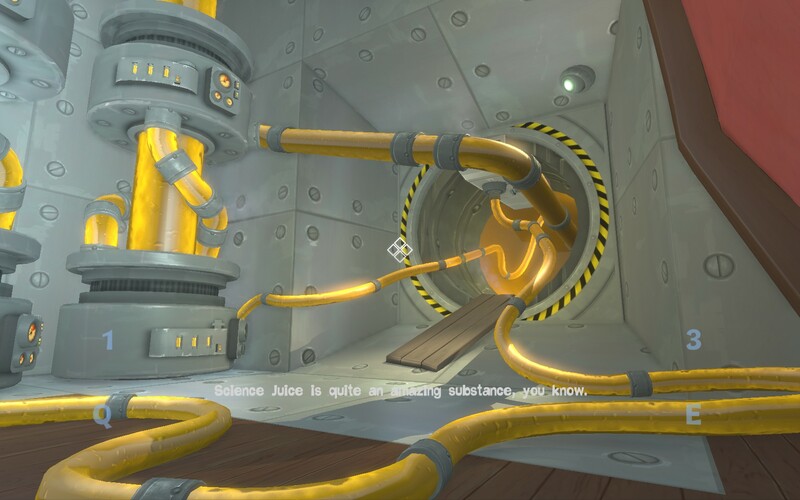 Right from the start Quantum Conundrum invokes that same feeling I had when playing the first portal game. Certainly Quantum Conundrum shares some of the same aesthetics that the Portal series did with some of the assets looking very similar to their Portal cousins. The level layout and disembodied voice following you constantly are also very similar which further adds to that bizzaro Portal world feeling. Graphically though it’s nothing particularly complex although the vibrant colour palette, heavy stylization, dynamic lighting and use of motion blur makes the whole package visually pleasing even if the graphics aren’t exactly cutting edge. Quantum Conundrum’s main game mechanic revolves around the use of 4 dimensions that have different properties to that of the normal world. The first one you’re introduced to is the fluffy dimension, essentially a world where everything looks quilted and is as light as a feather. This allows you to move objects that you wouldn’t be able to otherwise, usually to trigger switches or use said objects as a stepping stone. The second dimension is the heavy dimension which is in essence the opposite of the fluffy dimension. However the heavy dimension also makes all objects more dense, preventing them from being destroyed by the lasers that are usually present everywhere. 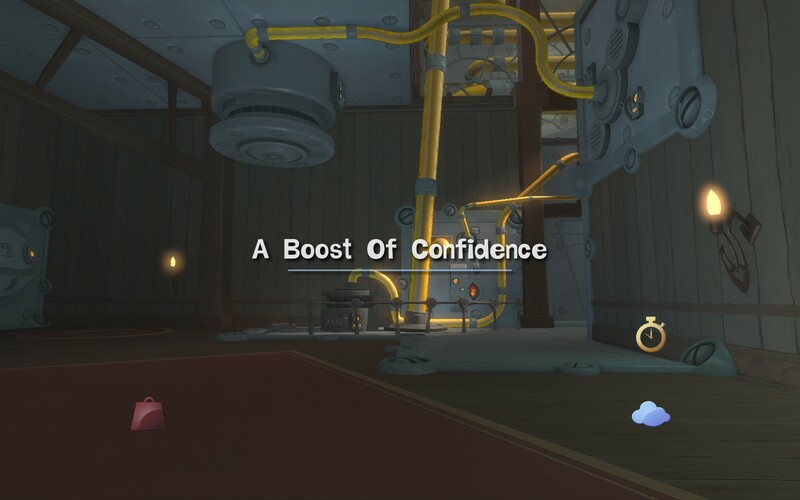 The heavy dimension can also be used to trigger switches with objects that wouldn’t usually trigger them opening up a fair few more possibilities for solving puzzles. The third dimension you’re given access to is one where time flows at a very slow rate compared to the normal world. In this dimension you can watch switches activate, laser beams slowly power down and even use it to throw an item and then jump on top of it enabling you to catapult yourself across vast distances. The final dimension is one where gravity is switched around making all objects float to the ceiling. This is usually used in order to get objects into a position where you can hop onto them, making the platformer aspect of Quantum Conundrum quite mind bending at times. Individually all these mechanics are interesting but hardly original as nearly all of those ideas have appeared in other games in one form or another (I can certainly remember things like that in the Half Life series of games). However any of them in combination turns what would appear to be a simple puzzle into an intriguing web of complexity especially when you consider the emergent behaviour that’s present in many of the puzzles. If I’m honest I got the most enjoyment out of the puzzles that utilized all 4 of the dimensions together as they were some of the most satisfying to solve. One of the puzzles I can remember was late in the game and required you to ride a cube up to the exit door. However in order to do so you’d have to throw it through a grid of lasers which meant that you first had to switch to the fluffy dimension (in order to throw it) and then quickly switch to the heavy dimension (so it didn’t get zapped by the lasers) and then slow down time (so you could jump on top of it) and then finally alternate the gravity in order to ride the cube up to the door. It took me more than a couple tries to get it right but it was one of the most satisfying puzzles I’ve done in quite a long time. Like any of these physics based games there’s always a few quirks to go along with the intended game play. More than once I had robots bug out on me (one I’m thinking of in particular was there to destroy safes I had dropped on the ground) meaning that the puzzle didn’t function as intended. Restarting from a check point solved this problem but after spending 5 to 10 minutes trying to solve the puzzle to find it is bugged can be quite frustrating. There were also a couple puzzles that seemed to punish you for missing things at the start, forcing you to retry the puzzle from the very start. Thankfully both these problems aren’t common but they were enough to see me put the game down a couple times during my 6.5 hours with it. There also seems to be something weird with the collision detection on the player character and all the other surfaces in the game. There were many times when I fell to my death when I hit the jump key but my character didn’t jump even though, from what I could tell at least, I was still on the platform I was trying to jump from. This isn’t an uncommon issue with puzzle platformers so its usually just a meta-game of figuring out when to hit the jump key in order to make the jump. It’s rather frustrating at first but towards the end you don’t really notice it until you miss a critical jump by mistiming your jump. 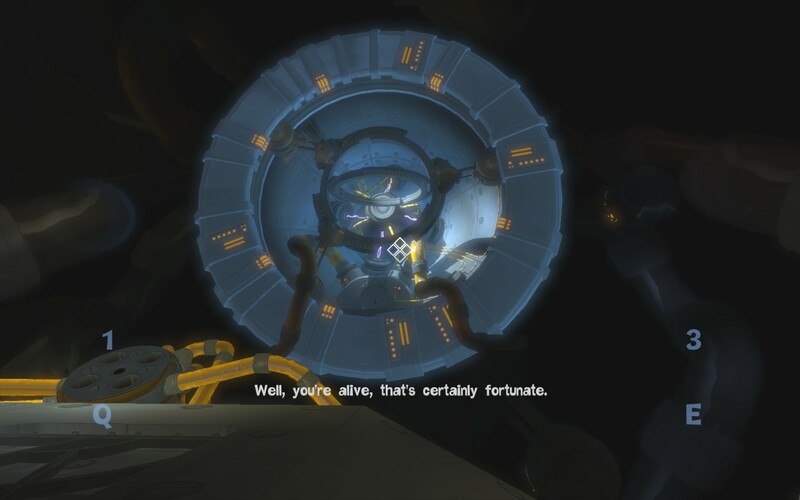 Whilst Portal had a some semblance of a story behind it the plot of Quantum Conundrum is really only there to serve as a motivator to dive deeper and deeper into the Quadwrangle Manor. It’s kind of campy with everything about the entire ordeal seemingly ludicrous and the disembodied voice of your uncle holding quite a bit of contempt for you the entire time doesn’t really endear him as a character to you. 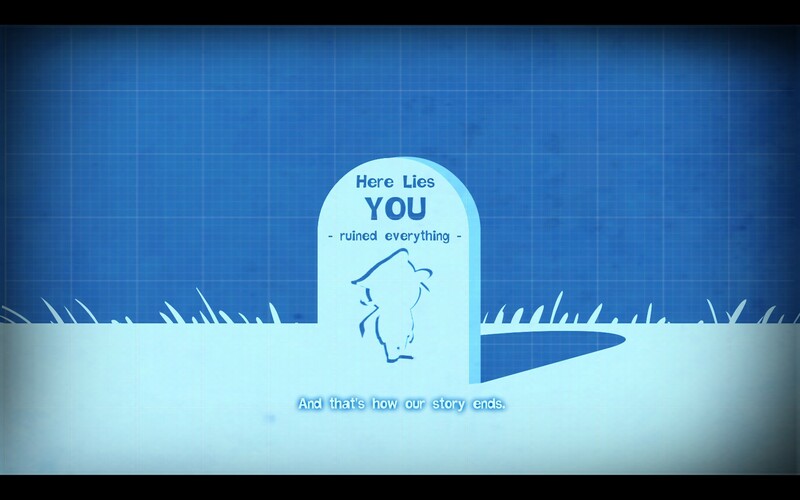 It’s in stark contrast to Portal where I felt for the main character and enjoyed the ridiculous contempt that the main protagonist showed for my character, as did everyone else who played the game. However the story doesn’t really matter so much as Quantum Conundrum excels on its game play alone showing Kim Swift’s trademark of making puzzlers with mechanics that start off simple but become incredibly complex as the game progresses on. I can’t say that Quantum Conundrum had me pegged to my seat like the original Portal did as I finished it over the course of 3 separate sittings but I did find the puzzles enjoyable, especially the later ones. There is of course a whole other game outside that of the main story of Quantum Conundrum in collecting all the collectables and getting all the achievements and if you’re the kind of insane completionist that loves this sort of thing then Quantum Conundrum is definitely for you. 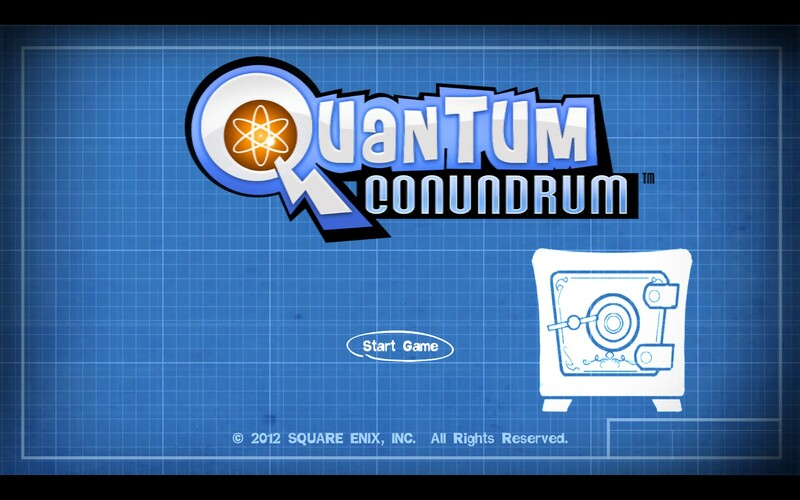 Quantum Conundrum is available right now on PC, Xbox360 and PS3 right now for $14.99 or equivalent on all platforms. Game was played entirely on the PC with 5 hours of total play time with 36% of the achievements unlocked.